Mitsubishi isn't one of the biggest-selling car manufacturers in the U.S. these days, but the Japanese automaker has been rebounding substantially in recent years thanks in large part to its focus on the popular crossover segment, led by the Outlander. The Mitsubishi Outlander has been offered in a plug-in hybrid (PHEV) variant for the last few years, and I've been testing out a brand-new 2019 model of the Outlander PHEV just as the first units are starting to roll out to dealers around the country. In the U.S. at least, changes from the 2018 model are primarily cosmetic aside from some tweaks to the suspension, noise and vibration reduction, and comfort. 2019 models in other countries are seeing some more substantial upgrades under the hood, but those have yet to make their way into the U.S. models. 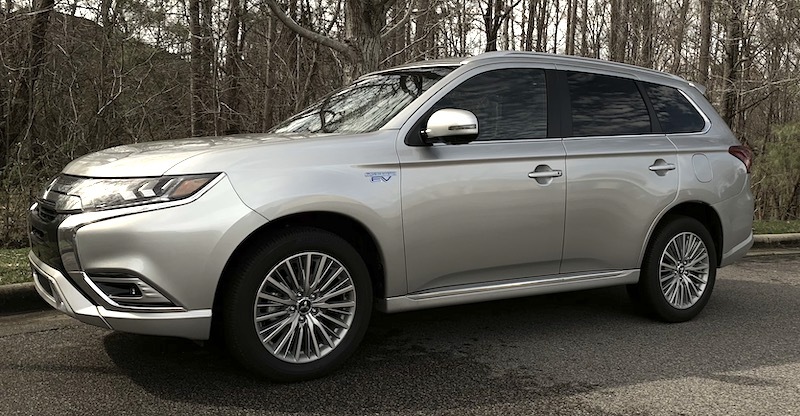 The U.S. version of the 2019 Outlander PHEV offers a 2.0 L 4-cylinder gas engine paired with dual 60 kW electric motors and a 12 kWh Li-ion battery. 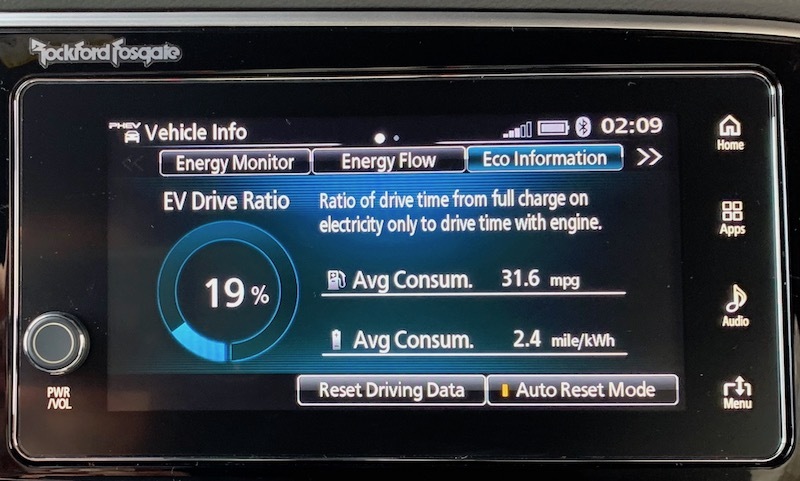 Operating solely on electric power, the Outlander PHEV can drive up to 22 miles depending on conditions, while it gets 25 MPG in gasoline-only mode, for a combined rating of 74 MPGe. But with a relatively small 11.3-gallon gas tank to make room for the batteries, overall range is only a little over 300 miles. 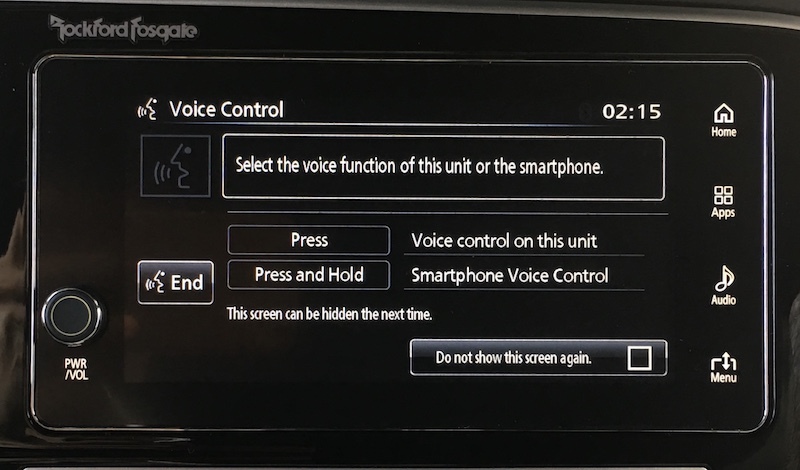 What's interesting about Mitsubishi's SDA system is that there is no embedded navigation available in U.S. models, with users instead needing to rely on CarPlay or Android Auto for their navigation needs. 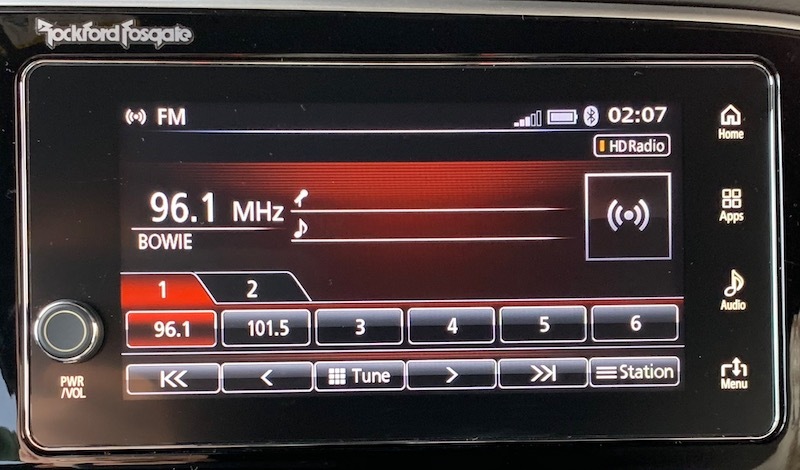 I spoke with Bryan Arnett, Mitsubishi's senior manager for accessory development and advanced technology, and he explained to me that the company made the decision to remove embedded navigation as an option in the United States as of 2016 models for several interrelated reasons. That said, Mitsubishi is part of the Renault–Nissan–Mitsubishi Alliance, which late last year announced that it will be among a number of car manufacturers moving to adopt Google's Android OS to drive their future infotainment systems. The move will allow users to access built-in versions of Google Maps and other services, although CarPlay will continue to be supported. The Alliance is planning to start rolling out vehicles with Android OS-based systems in 2021. There's also an Audio button to take you directly to the SDA audio functions and cycle through the various audio sources (including CarPlay's Music app), and a Menu button that pops up a panel at the lower right where you can access settings and other options depending on which SDA screen you're on. 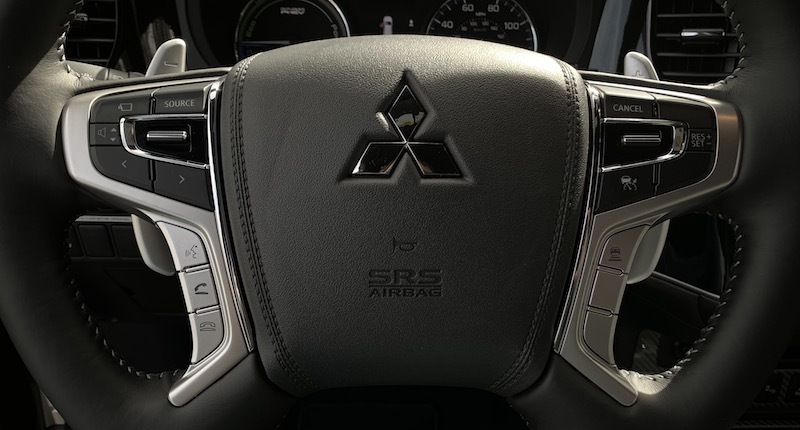 In general, Mitsubishi has worked to ensure that the SDA system is intuitive by limiting submenus and making sure everything you need should be no more than two taps away. That's certainly the case with most functions, but I feel like there are some areas where the interface could use some improvements. 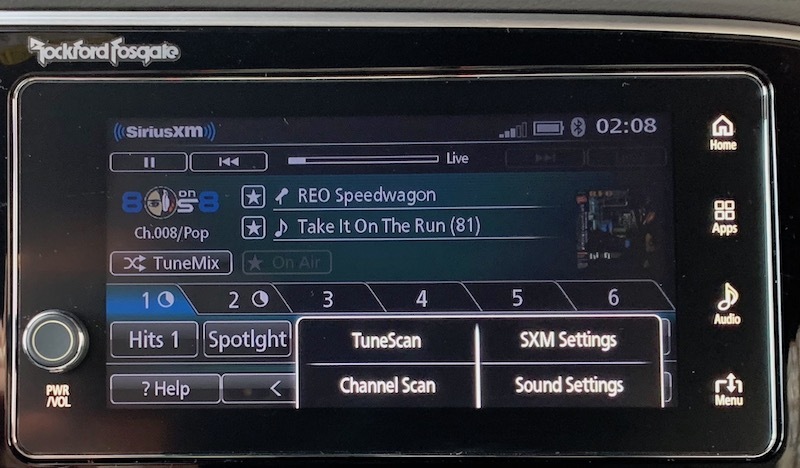 In particular, the SDA system could use a visual overhaul with modernization of icon and button designs, and some functions such as the SiriusXM screen feel quite cluttered. 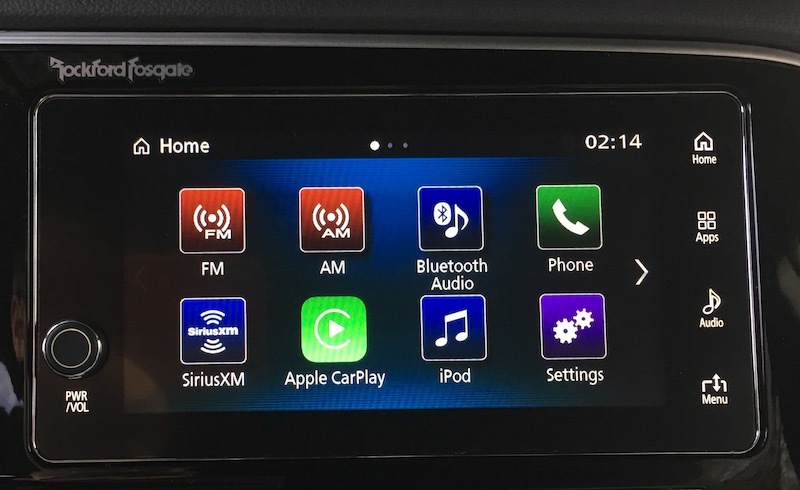 I recognize that SiriusXM offers a lot of features and I appreciate Mitsubishi's effort to make them all accessible, but I feel like there could definitely be some streamlining. 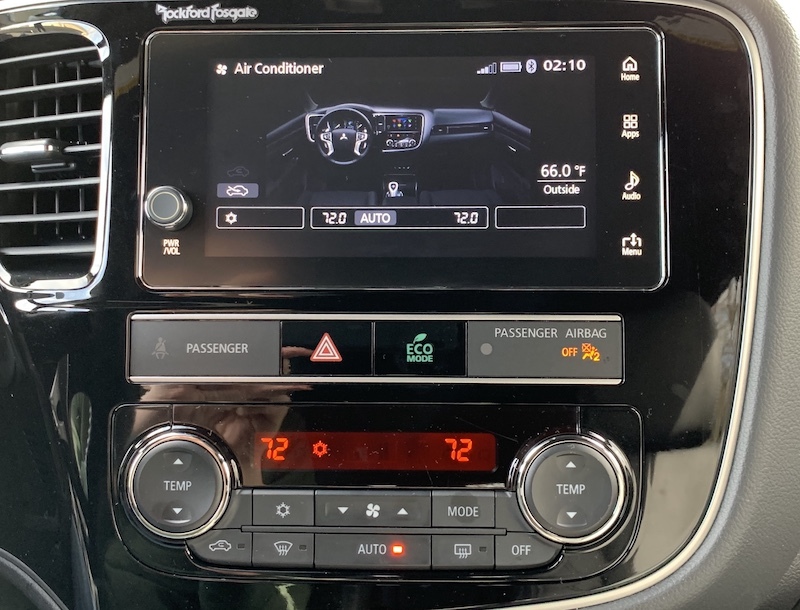 Climate controls are handled strictly through separate hardware controls located below the infotainment system, although you do get a brief climate setting overlay on the screen when you make an adjustment. 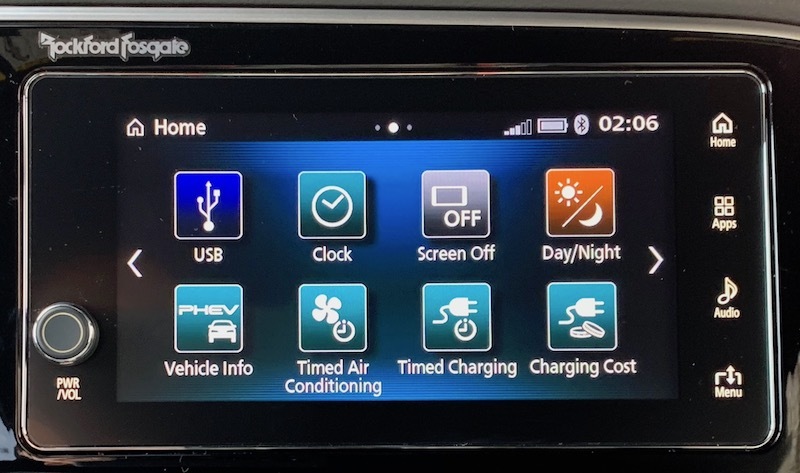 There's also an Air Conditioning icon on the SDA home screen that displays the current climate control settings, but you can't make any adjustments through the touchscreen. 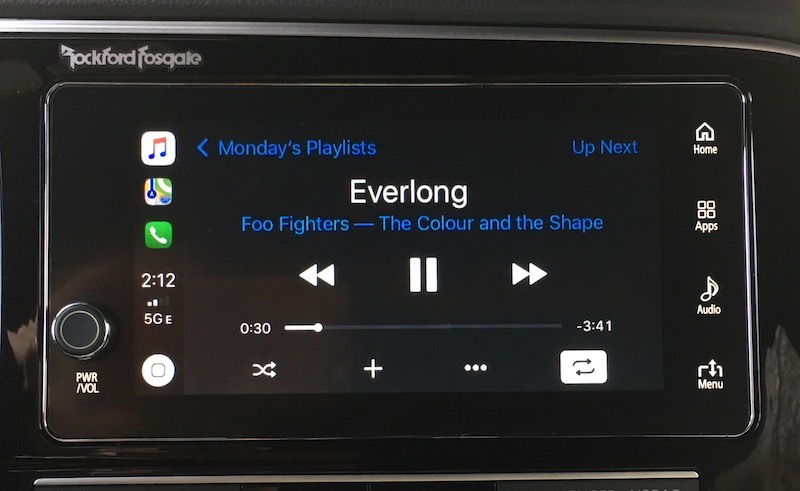 CarPlay uses a wired connection in the Outlander PHEV, which is unsurprising given how slow wireless CarPlay has been to take off. There's a single USB-A port near the bottom of the center stack, which comes with a rubberized plug cover that feels a little unnecessary and just seems to get in the way if you plan to be plugging and unplugging a USB cable frequently. CarPlay behaves as you'd expect on the 7-inch screen, which is about middle of the road in terms of screen sizes. Some views such as in maps feel a little on the small and cluttered side if you're used to an 8-inch screen, but it's completely usable. CarPlay is operated strictly by the touchscreen, with no additional touch pad or control knob on the center console, and that's fine with me. The dedicated Home and Apps buttons make it easy to jump in and out of CarPlay, although I'd prefer it if they were located on the left side of the screen for a little bit easier reach. The Outlander PHEV does come with a digital driver's display centered behind the steering wheel that can offer information such as range, MPG, trip odometers, energy flow, and more, but unfortunately there's no option to display audio information, a feature I typically like to use when the main infotainment screen is taken over by other functions such as CarPlay navigation. As I mentioned in the previous section, there's a single USB-A near the base of the center stack, where you can connect a phone for CarPlay or Android Auto, or other devices like iPods for audio purposes. A pair of cupholders are located very close to the USB port and serve as decent places to store a connected phone, but there's no dedicated phone storage tray. 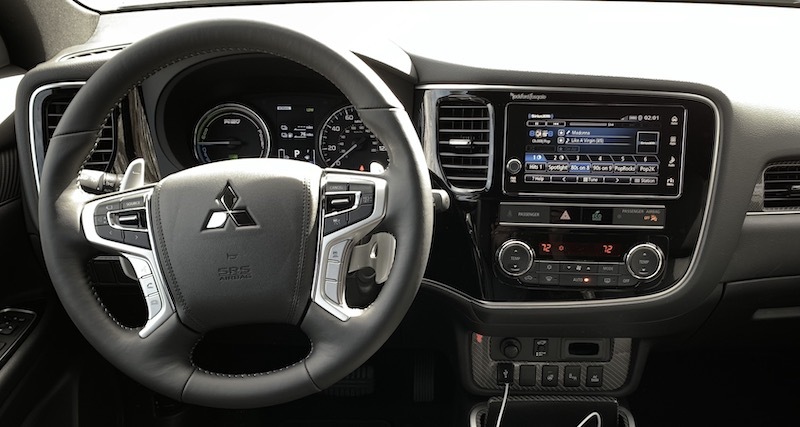 I do feel like Mitsubishi could have made room for a tray, as there is a fair amount of empty space on the center console even with some extra buttons and switches for managing the hybrid functions of the vehicle. 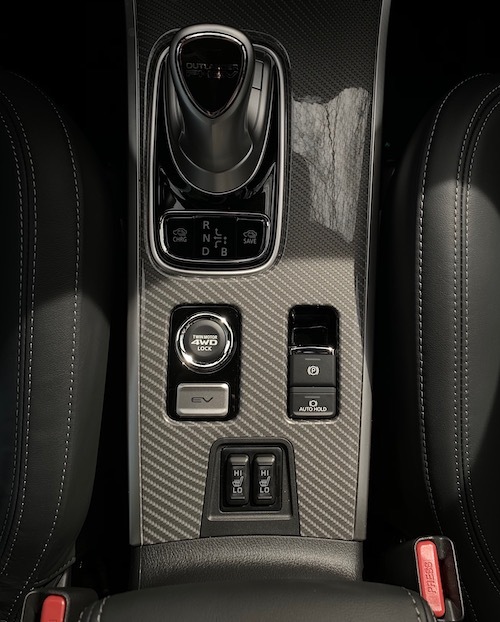 There's no USB port inside the center console compartment, which would have been another nice option to have for those who like to keep their phones hidden away while driving. 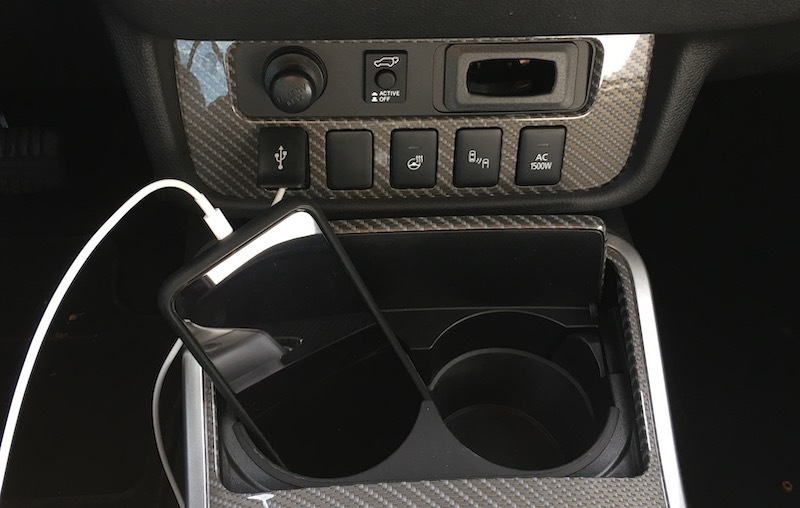 You can certainly still store your phone in the compartment, but you'll have a USB cable running out from under the lid all the way up to the dash. 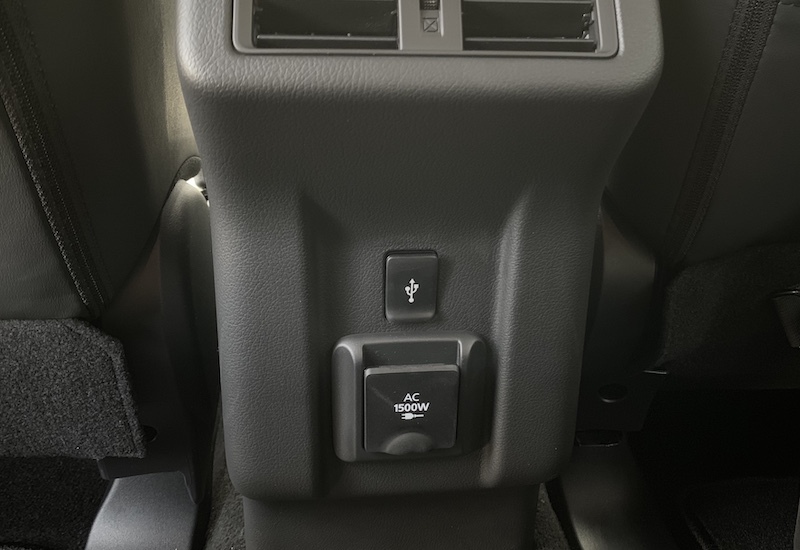 On the rear of the center console, you'll find a second USB-A port for rear passengers. It's a fully functional USB data port, so it can be used not only for device charging but also for CarPlay or a media source. 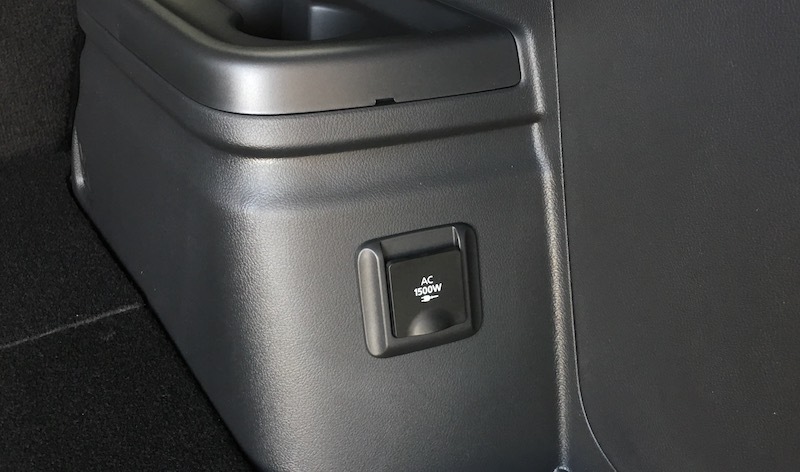 One thing that is available on the Outlander PHEV GT trim is a 1500-watt AC power system with one outlet on the rear of the center console and a second in the cargo area. When active, you can power all sorts of electrical devices using the system, which can be handy for camping, extended trips into remote areas, or even for household items during power outages. There's also a single 12V DC power port up front on the dashboard. 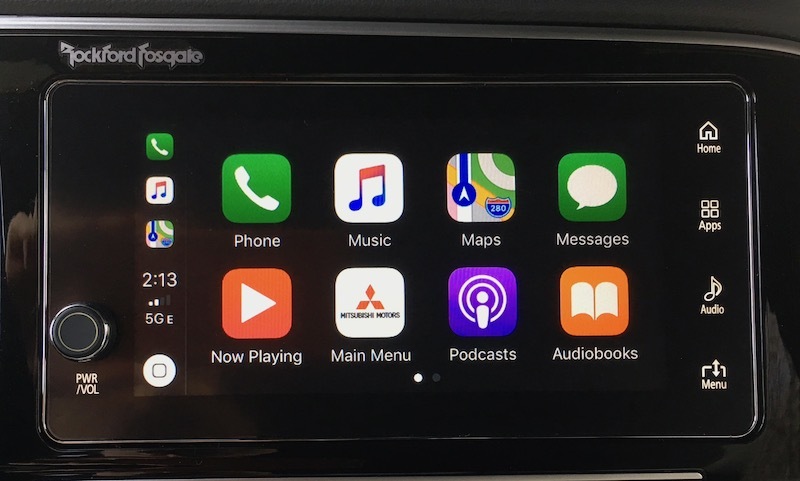 Overall, I was impressed with the CarPlay integration on Mitsubishi's latest SDA infotainment system, which the company tells me has been included on over 400,000 vehicles worldwide and over 100,000 in the United States. Interactions with CarPlay are fluid, and dedicated touch buttons for hopping in and out of CarPlay make for a smoothly integrated experience. As for SDA itself, it certainly offers a lot of capabilities, especially on the Outlander PHEV with all of its hybrid technology. I thought I'd miss an option for embedded navigation, but it's starting to make a lot of sense for companies to forego built-in navigation in favor of owners' own smartphones that can offer a better user experience. 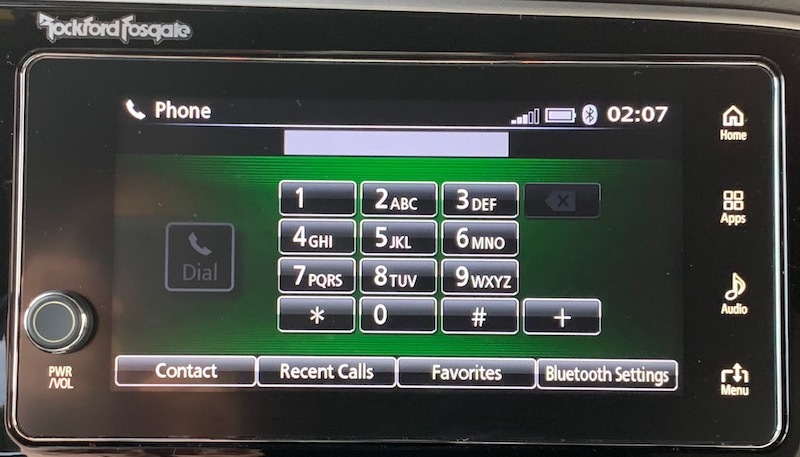 But while Mitsubishi has emphasized a streamlined menu hierarchy to limit the number of taps needed to access any option or setting, the visual design of the system could stand to see some improvement. It looks dated, and some screens end up looking quite cluttered. The home screens are easy-to-use grids with colorful icons to help you pick out what you're looking for at a quick glance, but again, the user interface element designs are looking rather dated and could really use some freshening up. I'm optimistic about Mitsubishi and other manufacturers moving toward Android OS in the next few years, as built-in Google Maps (and hopefully Waze) will be great additions to these systems. 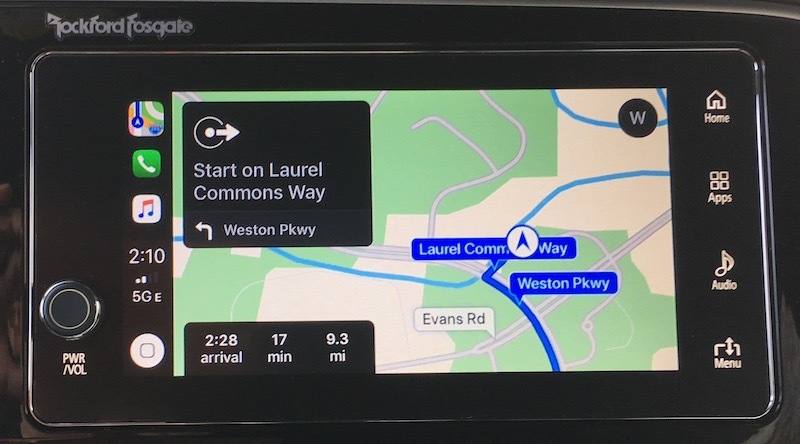 Cloud-based navigation systems do sometimes falter compared to embedded systems in areas of poor cellular coverage, but Mitsubishi tells me it's working on addressing that through caching and other means as it moves toward bringing built-in navigation back with Android OS. The base gas-powered Outlander ES trim starts at a little under $25,000, but you'll need to step up to the SE trim for an additional $1,000 in order to get the SDA system with CarPlay. If you're interested in the PHEV version of the Outlander, that starts around $35,000 for the SEL S-AWC trim with SDA and CarPlay standard. Stepping up to the higher-level GT S-AWC trim can push pricing up to around $42,000, with even more options and packages available on top of that. Keep in mind that the Outlander PHEV will qualify for federal electric vehicle tax credits of $5,836, so that'll go a long way toward making the PHEV version more price competitive compared to traditional gas models if you'd like to go that route. Gonna buy a Mitsubishi with my Discover card, go pick up some Fanta Cola and go home and watch the Starz network on my new Insignia TV; maybe make a few calls on my Jitterbug phone. We have the 2018 and while it's not a superstar in any category it's a solid performer in many. There are good reasons it's the best selling PHEV in the world. It's a decent family hauler with room for the occasional cargo load. It's the only all-wheel drive PHEV, we live in a hilly region with significant winter weather. 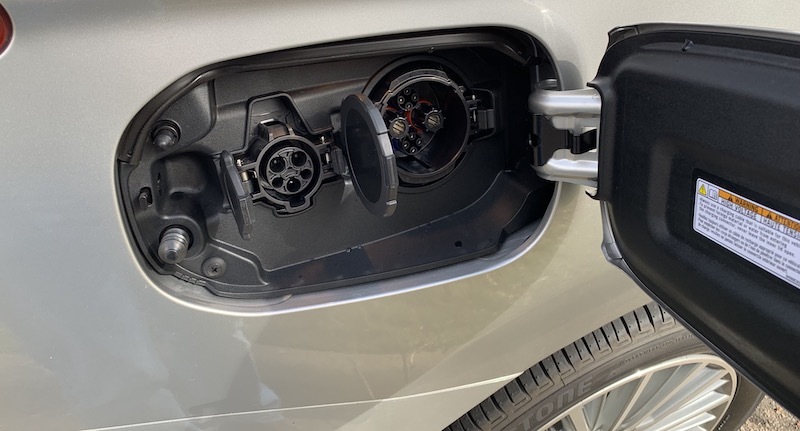 We work from home and so we only need one car but all electric isn't practical because we're in the exurbs with little public charging and where there is, it's always full. We're also unwilling to wait hours for a charger on I95 just to visit family. Not to mention, I don't trust vehicles that do over the air software updates. Comfort/handling wise, it's slightly less than our Outback Touring but far better than the Prius V5 we had before that. The heated steering wheel alone has made my winter. We're averaging ~80/60mpge (normal vs <32° weather) on the gas we do buy and only filling up ~once a month now. It was also an easy choice as we were installing solar at the time and so we're essentially charging for pennies to do the vast majority of our errands and drop-offs. Lastly, who knocks Starz? Have you seen Counterpart or American Gods? You got me with the Discover Card and the Fanta orange today. Own an older Mercedes, a Vizio TV and an iPhone though.